In a bowl, combine the strawberries, cucumber, cilantro, red onion, jalapeño, Tabasco, and lime zest. Set aside. Heat grill to medium-high heat. Brush fish with olive oil and season with salt and pepper on both sides. Grill fish for about 3 minutes, giving a quarter turn halfway through to make grill marks. Flip over and continue grilling for another 3 to 4 minutes for medium doneness. Remove from the grill and place on warm serving plates. Add lime juice and ¼ teaspoon salt to the salsa and combine. Taste and adjust seasoning, if necessary. Place a generous portion onto the plate with the swordfish and serve immediately. Nutritional information is for the swordfish-salsa combination. 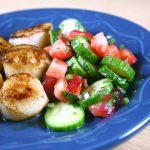 Substituting 24 ounces of scallops for the swordfish will result in a recipe with 245 calories, 10g fat (1g saturated), 55mg cholesterol, 425mg sodium, 10g carb, 1g fiber, 3g sugar, and 29g protein per serving. This recipe is a good source of Protein, Selenium, Vitamin C, Vitamin B12, and Phosphorus. If you use swordfish, you also get a shot of Niacin; if you use scallops, you get extra Magnesium.